George Galloway: a Man Fit for Holyrood? "Then we all walked out together..."
North West Labour conference: "the most political in years"! Tube jobs fight: fight against victimisations! Build a Revolutionary Party? But What Is a Revolutionary Party? 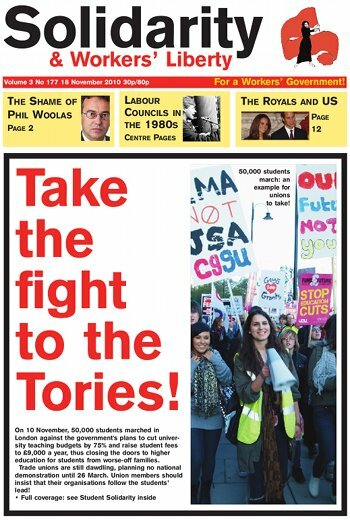 Take the fight to the Tories! Through cuts to more cuts... and default? Stop "work for your dole" scheme! From 29 November spouses or partners, from outside the European Economic Area, applying to come to Britain will have to pass an English language test before they come to the UK. This measure was designed by Labour but is being implemented a year early by the coalition government as a sign that it is prepared to be even tougher than its predecessor. In the 1930s and 1940s Van was a Trotskyist. In later years, after he had fled to France to escape the massacres being carried out by the Vietnamese Stalinists, he rejected Trotskyism and Leninism and became a supporter of “council communism”. The bulk of In the Crossfire deals with Van’s youth and political activities in Vietnam. The latter part of the book consists of two chapters from Van’s unfinished story of his life in France and three articles written by Van in the 1960s. The book has its defects. Jarvis Cocker’s work with Pulp during the Britpop era did much to keep class in the public consciousness at a time when it was being written-out of the rhetoric of New Labour, and barely noticed by the Britpop crowd who were getting high on the hype of “Cool Britannia”. If this will be the theme of a “reformed” Pulp then it will a welcome return. “Holyrood Could Be Calling Me Home” read the headline above George Galloway’s Daily Record column last week, in which he claimed that he was coming under increasing pressure to contest next year’s Scottish Parliament elections. Unnamed “football supporters, leaders of the Asian community, trade unionists, former constituents, and even members of the Labour Party” were supposedly all urging him to stand for election. A couple of weeks ago my daughter, aged seven, came home from school, requesting money for a poppy. With liberal indulgence, I explained why I believe wearing a red poppy linked to those who continue to make war is wrong. Then, with more difficulty, I explained why the pacifist white poppy is also problematic. I gave her 50p and told her to spend it wisely using her judgement. Princes, the dregs of their dull race... Mud from a muddy spring. Percy Shelley on the princes of England in 1819. Tom Paine, standing with Milton and Shelley at the head of England’s Republican tradition of writers, reminded us in the revolutionary year 1791 that monarchy was a sham and the principle of hereditary power an affront to all who believed in equality and democracy. The enormous French strike movement of this autumn has ground to a halt. But reports suggest workers do not feel defeated, and their organisations have emerged strengthened. Sarkozy, on the other hand, although he has got away with the pensions reform for the time being, is under pressure to be less ambitious in his cuts programme. The development of anti-cuts campaigns and committees has been one of the most immediate political consequences of the government’s cuts programme. The formation of such groups is of great significance. Local, fighting campaigns of action and solidarity could become a key element in reviving and re-making parts of the working class movement. At the Lambeth Living [Lambeth Council’s housing “Arms Length Management Organisation”] staff conference on 8 November there was a lot of anger and nervousness at the announcement of job cuts. Cuts are coming when directors are on salaries of over £100,000 a year and consultants on thousands a month, and all announced in a hall in London Bridge costing £9000 to hire.